By Marc, July 7, 2017 in Have a tip or idea? Airports in Munich and Hanover are among the first of the German airports to see cost savings from LED lighting. 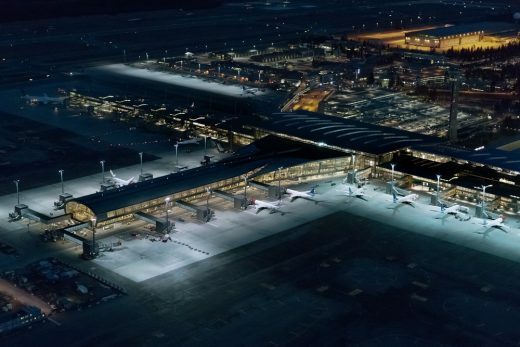 Munich’s Franz Josef Strauss Airport replaced runway, parking lot, and roadway lights with LED lighting systems. 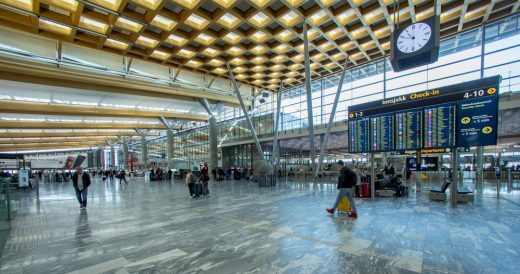 This airport expects to reduce its annual electricity consumption by 122,000 kilowatt hours as a result of this retrofit. 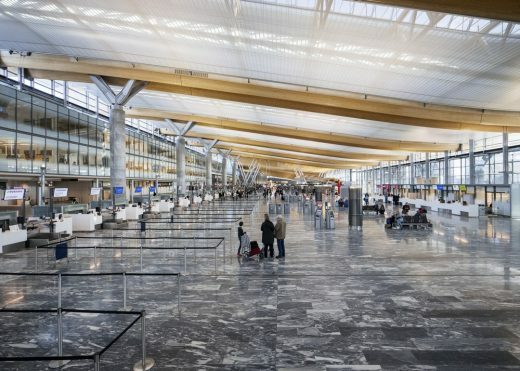 This reduces the airport’s electrical energy consumption by almost 50%. The airport’s maintenance costs will also decrease accordingly, as those LED’s will not require replacement until after more than 50,000 hours of operation. 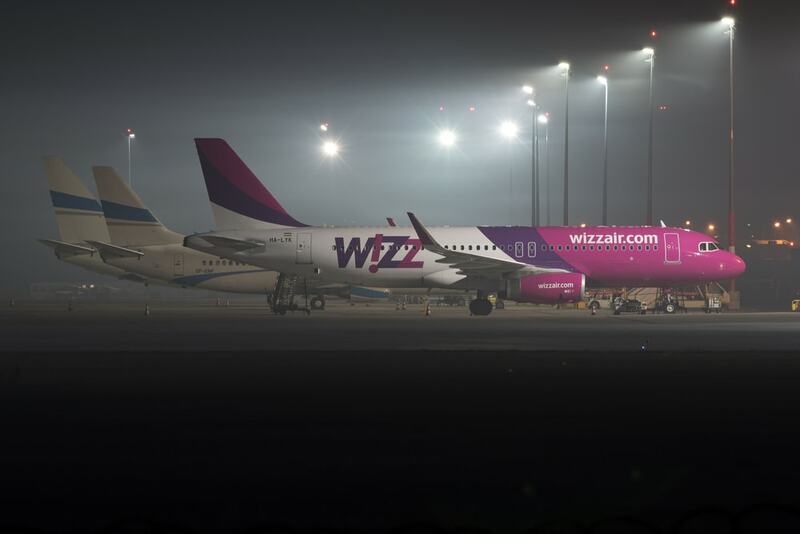 Some of the early testing of LED lighting, including cost savings prove-up, occurred at smaller airports such as northern Germany’s Paderborn-Lippstadt airport. That facility ran field tests between 2008 and 2009 in conjunction with an LED airport light manufacturer to verify efficiency, safety, and environmental friendliness. 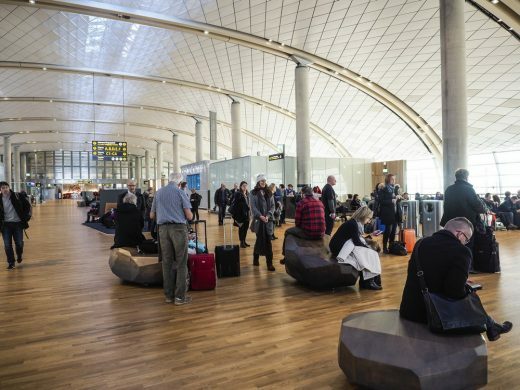 Technicians estimate that the airport could save up to 85% of its energy costs with a complete LED lighting retrofit, while simultaneously reducing servicing and maintenance costs by up to 70%. 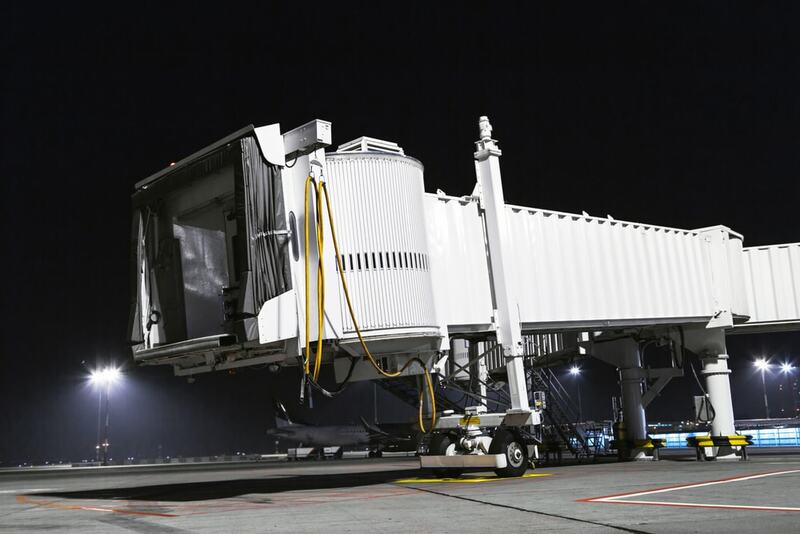 The adoption of airport ground lighting on runways and taxiways has cleared many European aviation regulatory hurdles. Safety is a primary consideration in all airport operations. The transition to LED lighting has met some resistance from regulators who have expressed concerns over the ability of airplane pilots to quickly adapt to the light spectrum provided by LED lights, notwithstanding the visibility improvements that are created by that spectrum. 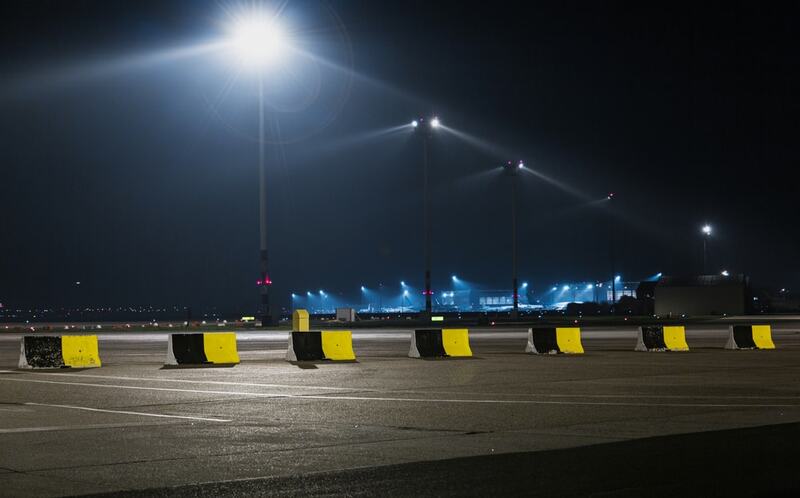 Safety studies have dismissed these concerns, however, and have shown that LED runway lighting can actually enhance safety. Airports in countries that border Germany have taken notice of the benefits that German airports are seeing from LED lights. 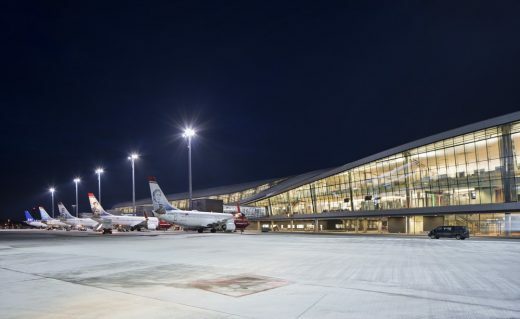 Austria’s Innsbruck Airport installed LED floodlights, leading to energy savings of almost 70%. Germany has long been a leader among countries that are seeking to reduce the carbon footprints of their industrial operations. 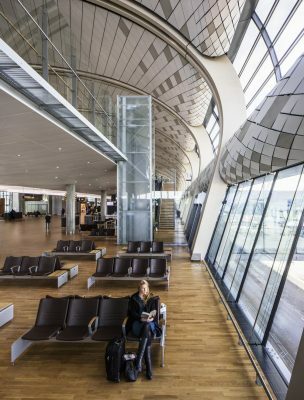 The transition to LED lighting systems by the country’s airport operations serves that interest at the same time as it saves costs and energy consumption. LED lighting systems incorporate no toxic materials that will contaminate landfills, they provide better illumination with lower energy consumption, and generate more effective lighting on runways and taxiways, inside terminals, and in ground operations around airports. 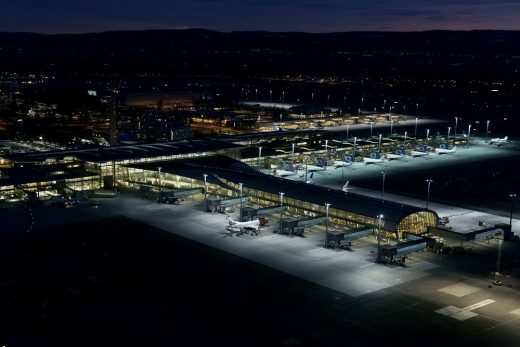 Outdoor lighting around an airport serves the important functions of safety and security, not only for the many who service and maintain airplanes, but also for the passengers who access planes and parking lots. For many years, the FAA has mandated standards for aeronautical ground lighting systems such as runway, taxiway and approach lighting. Other areas near the airport have been operating under guidance in the form of a published ‘RP’ – Recommended Practice guide. Until recently, the recommendations included the IES Aviation Lighting Committee document IESNA-RP-17-1987 (Airport Service Area Lighting), and the IESNA-RP-14-1987 (Airport Road Automobile Parking Area Lighting). Nearly 30 years later, these two RP’s have been combined and updated to IES RP-37-15. The document discusses lighting of the non-runway areas while emphasizing the restrictions, regulations, and best practices for the safe movement of aircraft, workers, pedestrians, and airport traffic. Many examples of light levels for various areas are suggested, but the document does not absolutely dictate light levels. This is partially due to conflicting suggested levels based on multiple functions in an area, local regulations, and other expectations and preferences that airports are likely to demand. This document will ‘shine a light’ on some of the RP-37 recommendations and provide additional insights into the important advantages that LED lighting provides. Outdoor lighting in the airfield’s protected environment illuminates activities such as aircraft parking, passenger boarding and deplaning on stairways, loading/unloading luggage, sanitary waste disposal hook-up, external air conditioning hook-up, ground power supply hook-up, aircraft fueling, mechanical checks and pre-flight inspections, plane de-icing, tire changes, and battery & hydraulic maintenance. Proper lighting specifications are critical to engineering an environment with ample safety and illumination for these important tasks. One of the important concepts from the RP-37-15 document, is that the lighting designer is encouraged to consider many factors in specifying apron and near airport lighting – not only to ensure adequate light levels, but also to reduce spillage and glare in the eyes of pilots and tower personnel. Recently, larger planes, additional service equipment, tighter schedules, and more passenger traffic are presenting new challenges. Fortunately, new lighting technologies provide opportunities to overcome these challenges and raise the bar in terms of more uniform lighting, truer color rendering, improved energy efficiency, longer service life, and comprehensive control solutions. Since objects are not inherently colored, but rather reflect different proportions of radiant energy, if the light incident on a surface changes, the apparent color of the object will change. LEDs can provide better color rendering due to advances in white LED technology outputting to a higher CRI (color rendering index) – thus producing vivid colors and contrasts. LEDs now provide more lumens per Watt when driven by high efficiency power supplies. Not only are these advanced power supply/drivers capable of accurately operating from a wide input voltage range, they are also capable of repeatable deeper dimming control. Accordingly, electronic controls can more easily interface to these LED drivers for timed or motion sensed intensity changes, security purposes, guided exit paths, or emergency override sequences. Unlike older technologies, LEDs can be ramped up or turned on instantly and likewise turned down instantly or gradually at any temperature. Traditional lamps with hot vapors inside are plagued by cold temperatures and short cycles which dramatically reduce lamp life due to the gases condensing on colder internal surfaces on each power cycle – especially if not sufficiently warmed up or when cold winds rapidly cool the glass. This can be seen by lamps with black bands near the colder ends or a gradually cloudy film forming on the internal glass surface which further cuts light output and reduces the working gas inside, leading to less light output and premature burn-out and/or color shift. Lamps with internal gases rarely reach their rated lifetime in actual use outside. Further diminished output and color shifting should be expected. In contrast, since they are solid state devices, LEDs are much more reliable and do not suffer from short cycling, start-up, or low temperature issues. As mentioned, a high quality LED fixture can produce a higher CRI which provides several advantages on the airport apron for those performing important tasks. For instance, baggage handlers often make routing decisions based on sorting tags containing colors. Fueling specialists use color to discern different fuel types. Those familiar with Avgas formulations will recognize three colors: green, blue, and purple, which are present in piston aircraft fuel types, while turbine engine colors are typically straw, clear, or red. Aircraft maintenance performed on the apron often includes recognizing specific colors of wires, hoses, and connectors. Since many apron workers have intimate access to the planes, lighting is important for face recognition and security observation. Airport apron lighting is extraordinarily important because of its close proximity to the active airfield. Adequately lighting this area is only part of the goal. Equally important is the light control from the apron to minimize glare and spillover into areas where it is not appreciated and can be dangerous. Pilot directed glare can diminish the visibility of ground lighting, directional signs, and painted markings on the airfield. Tower directed glare, backscatter, and reflections can distract tower personnel and make it harder to see past the apron into the generally dark active airfield area. Aircraft or service vehicles receiving direct illumination are highly reflective, often with a mirror-like finish. Specular surfaces like this can cause quite a glare and the solution is to illuminate with multiple light fixtures and from a large number of LED elements within those fixtures. Distributing the light to come from many sources means that at any one instant the glare is only from a small percentage of the overall illumination sum. The multiple source approach also minimizes shadows and leads to better overall uniformity. SpecGrade LED products are constructed with many high quality LEDs and individual lenses to provide the best performance for light output, containment, and thermal management. Additionally, SpecGrade LED products use multiple LED drivers so that a single failure can only reduce a given fixture output 25 to 50%. It is stressed in RP-37-15 that field verification of coverage and uniformity will be necessary to optimize the lighting for all interested parties. SpecGrade LED apron lights have optional glare shields and baffle options to assist in reducing troublesome glare. The adjustable baffle option can be used as a tool to find the optimal shield length and then order fixed parts, or just left in place. When the apron pavement is covered in snow, it may be necessary to dim or stagger lighting for the benefit of the tower. Being able to dim and control the apron lighting remotely is becoming more popular for these reasons. When designing the lighting systems, both maintenance and control of the lighting system should be considered. SpecGrade LED products can be configured with the LED drivers located up to 100 feet away from the LEDs. This may be convenient for centralized controls between poles or simply to keep the LED drivers more accessible so that service can be performed without giving up the entire area to a boom truck. Airport parking facilities for long and short term passengers include parking garages, large lots, and connecting service roads. These areas need special consideration near an airport to reduce glare, and light leakage into other areas. These light containment issues are best handled early in the design phase using well designed fixtures and photometric data for modeling and simulation. There is no substitute however for actual testing and tweaking as the real-life situation presents itself. For this reason, be sure to specify fixtures with known photometrics, cutoff angles, IES model files, and optional baffles to help shape the light output. SpecGrade LED products have many light distributions and baffle configurations available and we’re constantly adding more standard offerings; if you need something special it can be provided. Consult the factory for adjustable baffles useful for testing or as a permanent solution for future flexibility. Parking lots and connected areas are increasingly adding cameras for passenger safety, surveillance, and increased law enforcement for crime prevention. These might require an additional infrared lighting component to be added to the visible light, or the lights may need to be kept on at a minimum dimmed level. When motion is detected on an approaching pathway or access point, lights can be brought up to higher levels, lighting the exit roadway or other control scenarios which can save energy and extend the fixture lifetimes. Control communication systems include: power line carrier, RS-485, wireless, and several others. Choices depend on if two-way monitoring is needed, future expandability, open source compatibility, and distance traveled. 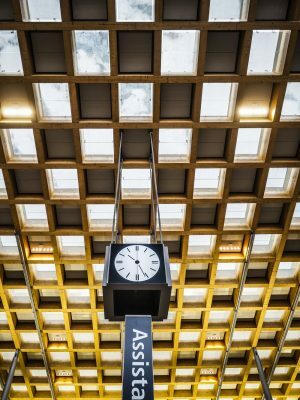 Advanced controls can provide additional functionality, energy savings and increase the fixture lifetime making the system cost return even more attractive. Contact the SpecGrade LED engineering group to discuss your needs and options. Sometimes a lighting structure or pole penetrates the obstacle limitation surface, which is an imaginary sloped angle emanating from the airfield and traveling upwards and outwards. Poles and obstacles closer to the airfield can exceed this obstacle limitation surface and require appropriate visual aids to avoid a collision. One such example is lighting on the top level of a parking garage or tall poles on an apron. Typically, the top of the pole will need to add an approved obstruction light such as an illuminated red L-810 fixture. SpecGrade LED can work with your mounting and custom electrical needs to accommodate many configurations. 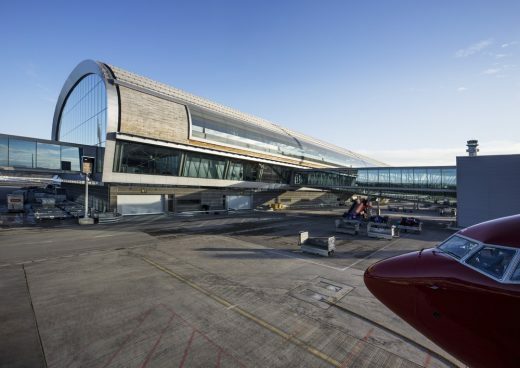 Nordic’s design increases the airport capacity from 19 million to an anticipated future capacity of 30 miliion, whilst passenger flow was improved with a maximum walking distance of just 450m, far shorter than most airports.